Belarusian (/bɛləˈruːsiən, -ʒən, -ʃən/; беларуская мова biełaruskaja mova [bʲelaˈruskaja ˈmova]) is an official language of Belarus, along with Russian, and is also spoken in Russia (where it is known as "Western Russian"), Poland and Ukraine. Before Belarus gained independence from the Soviet Union in 1991, the language was only known in English as Byelorussian or Belorussian, transliterating the Russian name, белорусский язык Belorusskiy yazyk, or alternatively as White Ruthenian (/ruːˈθiːniən/) or White Russian. Following independence, it has acquired the additional name Belarusian. Belarusian is one of the East Slavic languages and shares many grammatical and lexical features with other members of the group. To some extent, Russian, Rusyn, Ukrainian, and Belarusian are mutually intelligible. Its predecessor stage is known as Ruthenian (14th to 17th centuries), in turn descended from Old East Slavic (10th to 13th centuries). In the first Belarus Census of 1999, the Belarusian language was declared as a "language spoken at home" by about 3,686,000 Belarusian citizens (36.7% of the population). About 6,984,000 (85.6%) of Belarusians declared it their "mother tongue". Other sources, such as Ethnologue, put the figure at approximately 2.5 million active speakers. According to a study done by the Belarusian government in 2009, 72% of Belarusians speak Russian at home, while Belarusian is actively used by only 11.9% of Belarusians. Approximately 29.4% of Belarusians can write, speak, and read Belarusian, while 52.5% can only read and speak it. In the UNESCO Atlas of the World's Languages in Danger, the Belarusian language is stated to be vulnerable. The Belarusian alphabet is a variant of the Cyrillic script, which was first used as an alphabet for the Old Church Slavonic language. The modern Belarusian form was defined in 1918, and consists of thirty-two letters. Before that, Belarusian had also been written in the Belarusian Latin alphabet (Łacinka / Лацінка), the Belarusian Arabic alphabet (by Lipka Tatars) and the Hebrew alphabet (by Belarusian Jews). The Glagolitic script had been used, sporadically, until the 11th or 12th century. Besides the standardized lect, there exist two main dialects of the Belarusian language, the North-Eastern and the South-Western. In addition, there exist the transitional Middle Belarusian dialect group and the separate West Palyesian dialect group. The West Polesian dialect group is more distinct linguistically, close to Ukrainian in many aspects and is separated by the conventional line Pruzhany–Ivatsevichy–Telekhany–Luninyets–Stolin. There is a high degree of mutual intelligibility among Belarusian, Russian, and Ukrainian languages. Belarusian has 80% mutual intelligibility with Ukrainian, 75% with Russian, and 55% with the Polish language. The modern Belarusian language was redeveloped on the base of the vernacular spoken remnants of the Old Belarusian language, surviving in the ethnic Belarusian territories in the 19th century. The end of the 18th century (the times of the Divisions of Commonwealth) is the usual conventional borderline between the Old Belarusian and Modern Belarusian stages of development. By the end of the 18th century, (Old) Belarusian was still common among the minor nobility in eastern part of the Grand Duchy of Lithuania (in the territory of present-day Belarus). Jan Czeczot in the 1840s had mentioned that even his generation's grandfathers preferred speaking (Old) Belarusian. (According to A. N. Pypin, the Belarusian language was spoken in some areas among the minor nobility during the 19th century.) In its vernacular form, it was the language of the smaller town dwellers and of the peasantry and it had been the language of oral folklore. Teaching in Belarusian was conducted mainly in schools run by the Basilian order. The development of Belarusian in the 19th century was strongly influenced by the political conflict in the territories of the former GDL, between the Russian Imperial authorities, trying to consolidate their rule over the "joined provinces", and the Polish and Polonised nobility, trying to bring back its pre-Partitions rule (see also: Polonization in times of Partitions). One of the important manifestations of this conflict was the struggle for ideological control over the educational system. The Polish and Russian languages were being introduced and re-introduced, while the general state of the people's education remained poor until the very end of the Russian Empire. In summary, the first two decades of the 19th century had seen the unprecedented prosperity of Polish culture and language in the former GDL lands, and had prepared the era of such famous "Belarusians by birth – Poles by choice," as Mickiewicz and Syrokomla. The era had seen the effective completion of the Polonization of the lowest level of the nobility, the further reduction of the area of use of contemporary Belarusian, and the effective folklorization of Belarusian culture. Due both to the state of the people's education and to the strong positions of Polish and Polonized nobility, it was only after the 1880s–1890s that the educated Belarusian element, still shunned because of "peasant origin", began to appear in state offices. In 1846, ethnographer Pavel Shpilevskiy prepared a Belarusian grammar (using the Cyrillic alphabet) on the basis of the folk dialects of the Minsk region. However, the Russian Academy of Sciences refused to print his submission, on the basis that it had not been prepared in a sufficiently scientific manner. From the mid-1830s ethnographic works began to appear, and tentative attempts to study the language were instigated (e.g., Shpilevskiy's grammar). The Belarusian literary tradition began to re-form, based on the folk language, initiated by the works of Vintsent Dunin-Martsinkyevich. See also: Jan Czeczot, Jan Barszczewski. At the beginning of the 1860s, both the Russian and Polish parties in Belarusian lands had begun to realise that the decisive role in the upcoming conflicts was shifting to the peasantry, overwhelmingly Belarusian. So a large amount of propaganda appeared, targeted at the peasantry and written in Belarusian; notably, the anti-Russian, anti-Tsarist, anti-Eastern Orthodox "Manifesto" and the newspaper "Peasants' Truth" (1862–1863) by Kalinowski, and anti-Polish, anti-Revolutionary, pro-Orthodox booklets and poems (1862). The advent of the all-Russian "narodniki" and Belarusian national movements (late 1870s–early 1880s) renewed interest in the Belarusian language (See also: Homan (1884), Bahushevich, Yefim Karskiy, Dovnar-Zapol'skiy, Bessonov, Pypin, Sheyn, Nosovich). The Belarusian literary tradition was also renewed (see also: F. Bahushevich). It was in these times that F. Bahushevich made his famous appeal to Belarusians: "Do not forsake our language, lest you pass away" (Belarusian: Не пакідайце ж мовы нашай, каб не ўмёрлі). In course of the 1897 Russian Empire Census, about 5.89 million people declared themselves speakers of Belarusian. The end of the 19th century, however, still showed that the urban language of Belarusian towns remained either Polish or Russian. The same census showed that towns with a population greater than 50,000 had fewer than a tenth Belarusian speakers. This state of affairs greatly contributed to a perception that Belarusian was a "rural" and "uneducated" language. However, the census was a major breakthrough for the first steps of the Belarusian national self-awareness and identity, since it clearly showed to the Imperial authorities and the still-strong Polish minority that the population and the language were neither Polish nor Russian. The rising influence of Socialist ideas advanced the emancipation of the Belarusian language still further (see also: Belarusian Socialist Assembly, Circle of Belarusian People's Education and Belarusian Culture, Belarusian Socialist Lot, Socialist Party "White Russia", Alaiza Pashkievich, Nasha Dolya). The fundamental works of Yefim Karskiy marked a turning point in the scientific perception of Belarusian. The ban on publishing books and papers in Belarusian was officially removed (25 December 1904). The unprecedented surge of national feeling in the 20th century, especially among the workers and peasants, particularly after the events of 1905, gave momentum to the intensive development of Belarusian literature and press (See also: Naša niva, Yanka Kupala, Yakub Kolas). During the 19th and early 20th century, there was no normative Belarusian grammar. Authors wrote as they saw fit, usually representing the particularities of different Belarusian dialects. The scientific groundwork for the introduction of a truly scientific and modern grammar of the Belarusian language was laid down by the linguist Yefim Karskiy. By the early 1910s, the continuing lack of a codified Belarusian grammar was becoming intolerably obstructive in the opinion of uniformitarian prescriptivists. Then Russian academician Shakhmatov, chair of the Russian language and literature department of St. Petersburg University, approached the board of the Belarusian newspaper Naša niva with a proposal that a Belarusian linguist be trained under his supervision in order to be able to create documentation of the grammar. Initially, the famous Belarusian poet Maksim Bahdanovich was to be entrusted with this work. However, Bahdanovich's poor health (tuberculosis) precluded his living in the climate of St. Petersburg, so Branislaw Tarashkyevich, a fresh graduate of the Vilnya Liceum No. 2, was selected for the task. In the Belarusian community, great interest was vested in this enterprise. The already famous Belarusian poet Yanka Kupala, in his letter to Tarashkyevich, urged him to "hurry with his much-needed work". Tarashkyevich had been working on the preparation of the grammar during 1912–1917, with the help and supervision of Shakhmatov and Karskiy. Tarashkyevich had completed the work by the autumn of 1917, even moving from the tumultuous Petrograd of 1917 to the relative calm of Finland in order to be able to complete it uninterrupted. By the summer of 1918, it became obvious that there were insurmountable problems with the printing of Tarashkyevich's grammar in Petrograd: a lack of paper, type and qualified personnel. Meanwhile, his grammar had apparently been planned to be adopted in the workers' and peasants' schools of Belarus that were to be set up, so Tarashkyevich was permitted to print his book abroad. In June 1918, he arrived in Vilnius, via Finland. The Belarusian Committee petitioned the administration to allow the book to be printed. Finally, the first edition of the "Belarusian grammar for schools" was printed (Vil'nya, 1918). There existed at least two other contemporary attempts at codifying the Belarusian grammar. In 1915, Rev. Balyaslaw Pachopka had prepared a Belarusian grammar using the Latin script. Belarusian linguist S. M. Nyekrashevich considered Pachopka's grammar unscientific and ignorant of the principles of the language. But Pachopka's grammar was reportedly taught in an unidentified number of schools, from 1918 for an unspecified period. Another grammar was supposedly jointly prepared by A. Lutskyevich and Ya. Stankyevich, and differed from Tarashkyevich's grammar somewhat in the resolution of some key aspects. On 22 December 1915, Paul von Hindenburg issued an order on schooling in German Army-occupied territories in the Russian Empire (Ober Ost), banning schooling in Russian and including the Belarusian language in an exclusive list of four languages made mandatory in the respective native schooling systems (Belarusian, Lithuanian, Polish, Yiddish). School attendance was not made mandatory, though. Passports at this time were bilingual, in German and in one of the "native languages". Also at this time, Belarusian preparatory schools, printing houses, press organs were opened (see also: Homan (1916)). After the 1917 February Revolution in Russia, the Belarusian language became an important factor in political activities in the Belarusian lands (see also: Central Council of Belarusian Organisations, Great Belarusian Council, First All-Belarusian Congress, Belnatskom). In the Belarusian People's Republic, Belarusian was used as the only official language (decreed by Belarusian People's Secretariat on 28 April 1918). 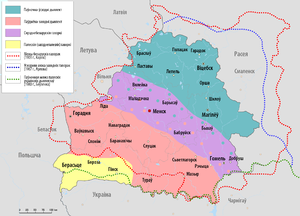 Subsequently, in the Belarusian SSR, Belarusian was decreed to be one of the four (Belarusian, Polish, Russian, and Yiddish) official languages (decreed by Central Executive Committee of BSSR in February 1921). In the BSSR, Tarashkyevich's grammar had been officially accepted for use in state schooling after its re-publication in unchanged form, first in 1922 by Yazep Lyosik under his own name as Practical grammar. P[art]. I, then in 1923 by the Belarusian State Publishing House under the title Belarusian language. Grammar. Ed. I. 1923, also by "Ya. Lyosik". In 1925, Lyosik added two new chapters, addressing the orthography of compound words and partly modifying the orthography of assimilated words. From this point on, Belarusian grammar had been popularized and taught in the educational system in that form. The ambiguous and insufficient development of several components of Tarashkyevich's grammar was perceived to be the cause of some problems in practical usage, and this led to discontent with the grammar. In 1924–25, Lyosik and his brother Anton Lyosik prepared and published their project of orthographic reform, proposing a number of radical changes. A fully phonetic orthography was introduced. One of the most distinctive changes brought in was the principle of akanye (Belarusian: ́аканне), wherein unstressed "o", pronounced in both Russian and Belarusian as /a/, is written as "а". The Belarusian Academic Conference on Reform of the Orthography and Alphabet was convened in 1926. After discussions on the project, the Conference made resolutions on some of the problems. However, the Lyosik brothers' project had not addressed all the problematic issues, so the Conference was not able to address all of those. To simplify Tarashkyevich's grammar where it was ambiguous or difficult in use, to amend it where it was insufficiently developed (e.g., orthography of assimilated words), and to create new rules if absent (orthography of proper names and geographical names). During its work in 1927–29, the Commission had actually prepared the project for spelling reform. The resulting project had included both completely new rules and existing rules in unchanged and changed forms, some of the changes being the work of the Commission itself, and others resulting from the resolutions of the Belarusian Academic Conference (1926), re-approved by the Commission. Notably, the use of the Ь (soft sign) before the combinations "consonant+iotified vowel" ("softened consonants"), which had been previously denounced as highly redundant (e.g., in the proceedings of the Belarusian Academic Conference (1926)), was cancelled. However, the complete resolution of the highly important issue of the orthography of unstressed Е (IE) was not achieved. 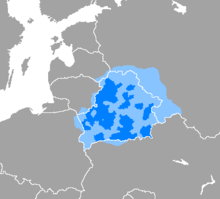 The prestige of the Belarusian language in the Western Belarus of the period hinged significantly on the image of the BSSR being the "true Belarusian home". [verification needed] This image, however, was strongly disrupted by the "purges" of "national-democrats" in BSSR (1929–30) and by the subsequent grammar reform (1933). In 1929–30, the Communist authorities of Soviet Belarus made a series of drastic crackdowns against the supposed "national-democratic counter-revolution" (informally "nats-dems" (Belarusian: нац-дэмы)). Effectively, entire generations of Socialist Belarusian national activists in the first quarter of the 20th century were wiped out of political, scientific and social existence. Only the most famous cult figures (e.g. Yanka Kupala) were spared. However, a new power group in Belarusian science quickly formed during these power shifts, under the virtual leadership of the Head of the Philosophy Institute of the Belarusian Academy of Sciences, academician S. Ya. Vol’fson (С. Я. Вольфсон). The book published under his editorship, Science in Service of Nats-Dems’ Counter-Revolution (1931), represented the new spirit of political life in Soviet Belarus. The Reform of Belarusian Grammar (1933) had been brought out quite unexpectedly, supposedly [Stank 1936], with the project published in the central newspaper of the Belarusian Communist Party (Zviazda) on 1933-06-28 and the decree of the Council of People's Commissars (Council of Ministers) of BSSR issued on 1933-08-28, to gain the status of law on 1933-09-16. There had been some post-facto speculations, too, that the 1930 project of the reform (as prepared by people who were no longer seen as politically "clean"), had been given for the "purification" to the "nats-dems" competition in the Academy of Sciences, which would explain the "block" nature of the differences between the 1930 and 1933 versions. Peculiarly, Yan Stankyevich in his notable critique of the reform [Stank 1936] failed to mention the 1930 project, dating the reform project to 1932. The reform resulted in the grammar officially used, with further amendments, in Byelorussian SSR and modern Belarus. Sometimes this grammar is called the official grammar of the Belarusian language, to distinguish it from the pre-reform grammar, known as the classic grammar or Taraškievica (Tarashkevitsa). It is also known as narkamauka, after the word narkamat, a Belarusian abbreviation for People's Commissariat (ministry). The latter term bears a derogatory connotation. After the Second World War, several major factors influenced the development of the Belarusian language. The most important was the implementation of the "rapprochement and unification of Soviet people" policy, which resulted by the 1980s in the Russian language effectively and officially assuming the role of the principal means of communication, with Belarusian relegated to a secondary role. The post-war growth in the number of publications in the Belarusian language in BSSR drastically lagged behind those in Russian. The use of Belarusian as the main language of education was gradually limited to rural schools and humanitarian faculties. The BSSR counterpart of the USSR law "On strengthening of ties between school and real life and on the further development of popular education in the USSR" (1958), adopted in 1959, along with introduction of a mandatory 8-year school education, made it possible for the parents of pupils to opt for non-mandatory studying of the "second language of instruction," which would be Belarusian in a Russian language school and vice versa. However, for example in the 1955/56 school year, there were 95% of schools with Russian as the primary language of instruction, and 5% with Belarusian as the primary language of instruction. While officially much lauded, the language was popularly represented as an "uncultured, rural language of rural people". That was the source of concern for the nationally minded and caused, for example, the series of publications by Barys Sachanka in 1957–61 and the text named "Letter to a Russian Friend" by Alyaksyey Kawka (1979). The BSSR Communist party leader Kirill Mazurov made some tentative moves to strengthen the role of Belarusian language in the second half of the 1950s. However, the support for the Belarusian language could also be easily considered "too strong" and even identified with the support of "Belarusian nationalists and fascists". The process of government support for "Belarusization" began even before the breakup of the Soviet Union, with the Supreme Soviet of the BSSR passing a law on languages in 1990 that aimed for the gradual increase in prestige and general use of the Belarusian language over the next 10 years, followed by the creation that same year of a National Language Program to support this endeavor .After Belarus became independent in 1991, support for the cause Belarusian language gained in prestige and popular interest, with the post-Soviet Belarusian government continued creating policies to actively promote the use of the Belarusian language, especially in education. The creation of the 1994 Constitution declared Belarusian to be the sole official language, though Russian was given the status as "language of inter-ethnic communication". However, the implementation of the 1992–94 "Law on Languages" took place in such a way that it provoked public protests and was dubbed "Landslide Belarusization" and "undemocratic" by those opposing it in 1992–94. In a controversial referendum held on 14 May 1995 the Belarusian language lost its exclusive status as the only state language. State support for Belarusian language and culture in general has dwindled since then, and Russian is dominant in everyday life in today's Belarus. In a 2006 article, Roy Medvedev compared the position of the Belarusian language in Belarus with that of the Irish language in the Republic of Ireland. A spelling reform of the official Belarusian language, making the spelling of some words more similar to Taraškievič's system, was decided on July 23, 2008, and went into effect on September 1, 2010. Under the regime of the authoritarian president Alexander Lukashenko, members of the Belarusian speaking minority in Belarus complained about discrimination against the Belarusian language in Belarus. Despite a formally equal status of Russian and Belarusian, Russian is primarily used by the Belarusian government, and cases of discrimination against the Belarusian language are not rare, even though the discrimination is not institutionalized. Authorities occasionally make minor concessions to demands for a widening of the usage of the Belarusian language. Organizations promoting Belarusian language such as the Frantsishak Skaryna Belarusian Language Society were reported being object of attacks by Belarus-based Russian neo-Nazi groups in the 1990s and 2000s. The right to receive full oral and written information in Belarusian language on the products and services proposed by commercial companies. Belarusian speakers are facing numerous obstacles when trying to arrange Belarusian language education for their children. As of 2016[update] there are no Belarusian-language universities in the country. In its 2016 country human rights on Belarus report, the US State Department also stated that there was "discrimination against ... those who sought to use the Belarusian language." "Because the government viewed many proponents of the Belarusian language as political opponents, authorities continued to harass and intimidate academic and cultural groups that sought to promote Belarusian and routinely rejected proposals to widen use of the language," the report said. In the 2010s the situation of Belarusian has started to change slightly due to the efforts of language-advocacy institutions, of individual representatives of such educational, cultural, scientific and linguistic organizations as the Frantsishak Skaryna Belarusian Language Society, the Belarus Academy of Sciences, the Belarusian Writers' Union, and in response to the endeavours of pro-Belarusian public figures from the media and communication field, musicians, philosophers, entrepreneurs and benefactors. And despite the language losing its exclusive position in the wake of the 1995 Belarusian referendum, new signs of the spread of Belarusian have appeared, trickling down into Belarusian society — with advertising campaigns supporting the cause (outdoor billboards promoting and acquainting people with the Belarusian language, branding campaigns for the leading telecommunication providers like Velcom, etc. ), the simplified version of the Belarusian Latin alphabet on the metro map being introduced into the messages of the transport network, dedicated advertising festivals like AD!NAK upholding marketing communication in Belarusian, and informal language-courses (such as Mova Nanova, Mova ci kava, Movavedy) having sprung up in Minsk and around Belarus and spurring further interest of people, especially of young people, in developing good Belarusian communication skills in everyday life. Belarusian (also spelled Belarusan, Belarussian, Byelarussian) – derived from the name of the country "Belarus", officially approved for use abroad by the Belarusian authorities[which?] (ca. 1992) and promoted since then. White Ruthenian (and its equivalents in other languages) – literally, a word-by-word translation of the parts of the composite word Belarusian. ^ a b "Population classified by knowledge of the Belarusian and Russian languages by region and Minsk City". Belstat.gov.by. Retrieved 2 December 2018. ^ Jan Jiřička. "Česko má nové oficiální národnostní menšiny. Vietnamce a Bělorusy - iDNES.cz". Zpravy.idnes.cz. Retrieved 2017-01-10. ^ Hammarström, Harald; Forkel, Robert; Haspelmath, Martin, eds. (2017). "Belarusian". Glottolog 3.0. Jena, Germany: Max Planck Institute for the Science of Human History. ^ Yefim Karsky. «Belarusians. II. The language of Belarusian people». В. 1. — [S.l. ], 1908. ^ a b "Belarusan". Ethnologue.com. Retrieved 2017-01-10. ^ In Russia, the Belarusian language is declared as a "familiar language" by about 316,000 inhabitants, among them about 248,000 Belarusians, comprising about 30.7% of Belarusians living in Russia (data from Russian Census (2002) In Russian[dead link]). In Ukraine, the Belarusian language is declared as a "native language" by about 55,000 Belarusians, which comprise about 19.7% of Belarusians living in Ukraine (data from 2001 Ukrainian census In Ukrainian). In Poland, the Belarusian language is declared as a "language spoken at home" by about 40,000 inhabitants (data from 2002 Polish general census Table 34 (in Polish) Archived May 25, 2005, at the Wayback Machine). ^ "Moseley, Christopher (ed.). 2010. Atlas of the World's Languages in Danger, 3rd edn. Paris, UNESCO Publishing. Online version". www.unesco.org. Retrieved 2018-12-31. ^ "Belarusian language, alphabet and pronunciation". Omniglot.com. Retrieved 2017-01-10. C.F. Voegelin and F.M. Voegelin. 1977. Classification and Index of the World's Languages (Elsevier). Pg. 311, "In terms of immediate mutual intelligibility, the East Slavic zone is a single language." As members of the East Slavic group of languages, they are descended from a common ancestor. ^ Robert Lindsay. "Mutual Intelligibility of Languages in the Slavic Family". www.academia.edu. Retrieved 2018-05-24. ^ The BSSR Council of Ministers approved the project of the Commission on Orthography "On making more precise and on partially changing the acting rules of Belarusian orthography" («Аб удакладненні і частковых зменах існуючага беларускага правапісу») on 11 May 1957. The project served as a basis for the normative Rules of the Belarusian Orthography and Punctuation («Правілы беларускай арфаграфіі і пунктуацыі»), published in 1959. ^ a b Bekus, Nelly. "Belarusian Language Policy in the Context of Linguistic Human Rights" (PDF). Harvard Faculty of Arts and Sciences. p. 5. ^ "Internationalizing teacher education: The case of Belarus". Mar 2012. Retrieved 2017-12-19. ^ Медведев, Р. (March 2006). "Непрерывное развитие языков: их влияние друг на друга и конкуренция". Наука и жизнь. Retrieved 2017-11-23. Положение дел с языком в Белоруссии сходно с положением в Ирландии. ^ a b c "Country Reports on Human Rights Practices for 2007". House, Committee on Foreign Affairs, and Senate, Committee on Foreign Relations - 2008. 2008. p. 1163. Retrieved 29 November 2017. ^ "A review of language policy in Belarus". Frantsishak Skaryna Belarusian Language Society. 3 April 2012. Retrieved 29 November 2017. ^ "Parents of Belarusian-language pupils in Baranavichy petition Prosecutor General over discrimination". Viasna Human Rights Center. 19 January 2015. Retrieved 29 November 2017. ^ a b "Country Reports on Human Rights Practices for 2016". US Department of State Bureau of Democracy, Human Rights and Labor. 2017. Retrieved 27 November 2017. ^ Acc. to: Улащик Н. Введение в белорусско-литовское летописание. – Moscow, 1980. ^ "Type: language". Iana.org. 2016-10-12. Retrieved 2017-01-10. Ігар Бараноўскі (2004). "Помнік сьвятару-беларусу (120-ыя ўгодкі з дня нараджэньня а. Баляслава Пачопкі)". Царква. Грэка-каталіцкая газета (4 (43)). Брэст: ПП В.Ю.А. Pashkievich V. (1974). Fundamental Byelorussian — Беларуская мова. Books 1,2. Toronto. Are The Belarusian And Russian Languages Very Similar?